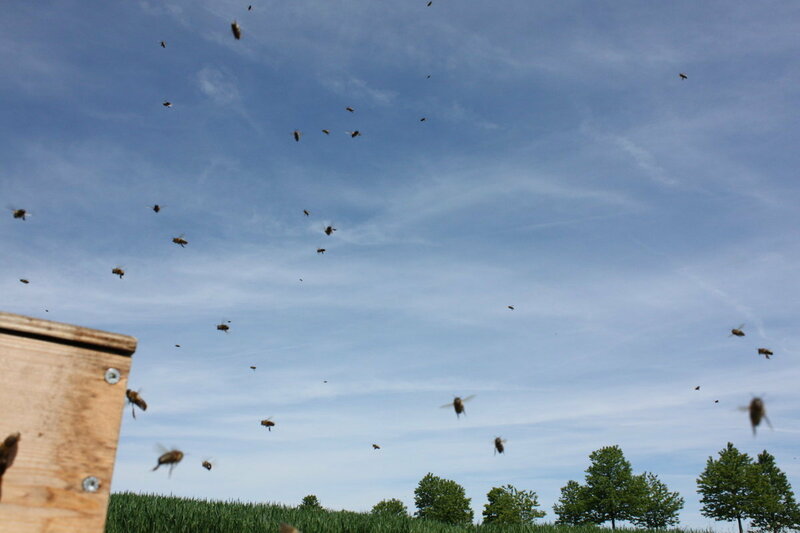 As an amateur beekeeper early summer has it that I often have to deal with some bee swarms. Today the second of my originally three bee colonies swarmed (giving me bee hive number five...). 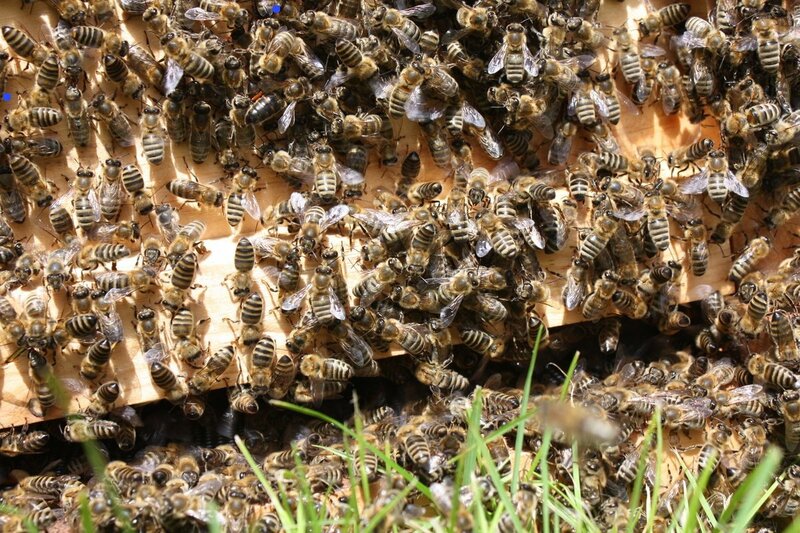 During swarming thousands of worker bees leave their colony together with the old queen just before a virgin queen hatches and takes over the old colony. If you happen to come into a bee swarm unprepared it might seem fascinating and dangerous at the same time. However, as they don´t have to defend honey or brood at this stage, swarming bees are normally pretty peaceful and won´t sting you without a reason (such as your own aggressive behaviour). 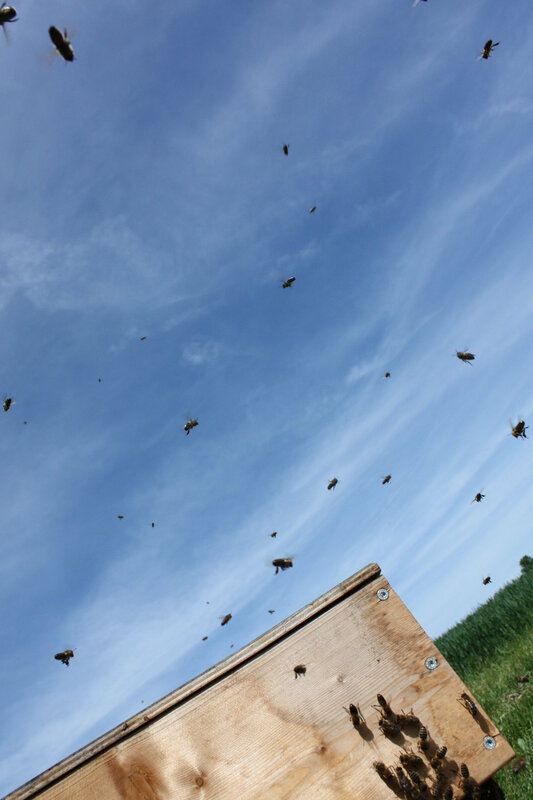 Here some shots I took after I had collected most of the swarming bees in a new box. It takes some hours until all bees have found their way to the rest of the swarm and especially to their queen. At this stage there were still dozens of bees up in the air. 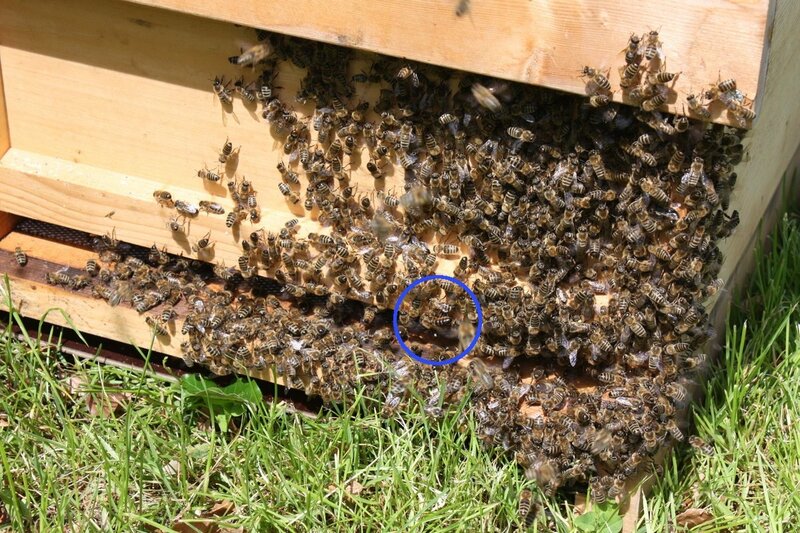 The swarm bees have filled their guts with honey (= fuel) before they left the old colony and they feed each other if necessary (blue circle). Bees use a lot of chemistry to communicate. 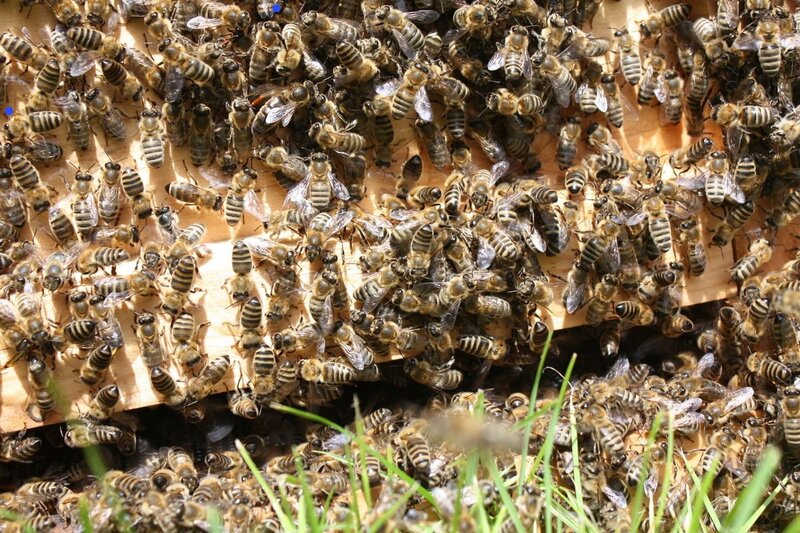 The queen releases a queen pheromone which tells the workers to gather around her (and to not lay eggs...because all worker bees are female actually and could theoretically do so without a queen). 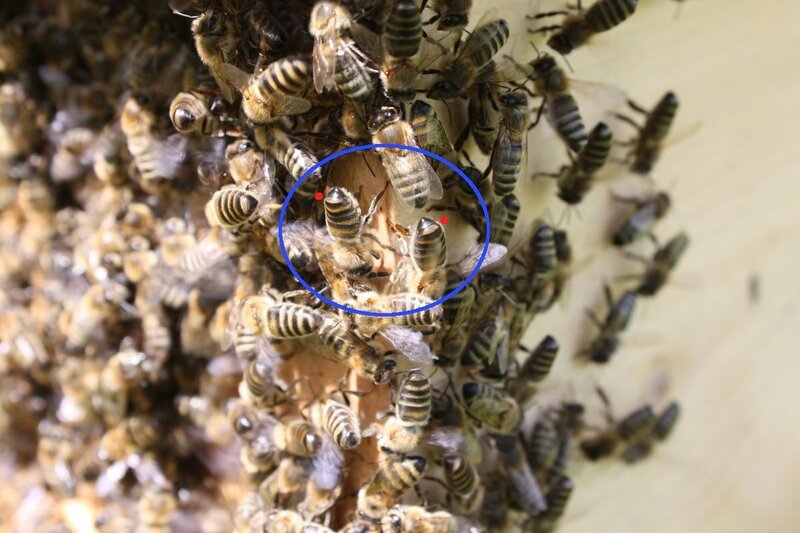 The bees in the blue circle have exposed their Nasonov glands (on the upper side of the abdomen, next to the red dots) and use their wings for ventilation of the Nasonov pheromone. The latter is a chemical signal which guides the swarming bees their way to the colony. 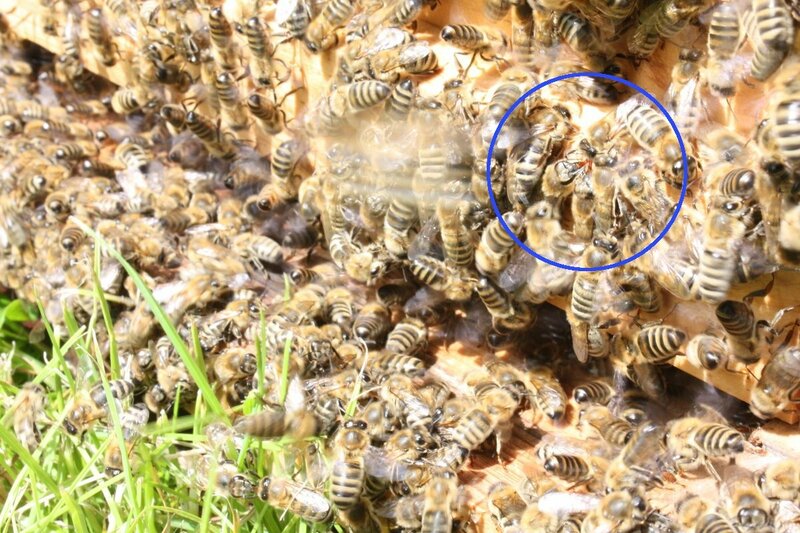 Interestingly the queen (blue circle, due to the egg-laying activity, the queen has a significantly longer abdomen) came out for a few minutes which made it easy to take these shots.